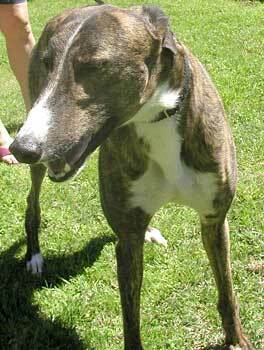 Jake, aka Protect Me, is a strikingly handsome dark brindle almost 2½-year-old male, born December 26, 2001. His sire is Molotov, making his grand sire HB's Commander, and his dam is J Johnson. Jake ran in Multnomah from July 2003 to October 2003. 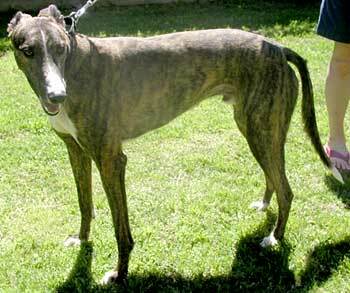 He was then moved to Valley Race Park, where his last race was January 21, 2004, when he broke his hock. His leg is now healed, and he is taking it easy still with no all-out running allowed for several more weeks. Jake is quite the personable guy with a smile always showing. It is not known at this time if Jake is small animal or cat tolerant.